Two weeks ago I read a few stories from a short story collection “Japanese Tales of Mystery and Imagination” by Edogawa Rampo (1894-1965), considered the first modern Japanese writer of mystery. His birth name was Taro Hirai, but he seemed to love Edgar Allan Poe’s writings so much early in his career that he even derived his own pen name from the Japanese pronunciation of Edgar Allan Poe. The story that struck me the most was “The Red Chamber”, originally published in April 1925, in which the main character and a narrator is a very bored eccentric individual who joins a strange club and starts killing as a way of curing his boredom, although the killings are more just planned accidents. I feel bored quite often, and I was in one of my everything-is-boring phases when I started reading this story so I could connect with the main character in this regard and here is something he tells us about himself: “I believe (he said) that I am in my right mind and that all my friends will vouch for my sanity, but whether I am really mentally fit or not, I will leave to you to judge. Yes, I may be mad! Or perhaps I may just be a mild neurotic case. But, at any rate, I must explain that I have always been weary of life… and to me the normal man’s daily routine is – and always will be – a hateful boredom. The feeling of intense boredom and aggravation of the repetitive flow of day to day life is something very relatable, especially this line: “Nothing that I did – absolutely nothing – succeeded in pleasing my fancy.” Oh how I know the feeling! But there is another fragment of the story which I found interesting, something related to art. In the last few pages the story takes place in a cafe where the main character and his friends from the club are talking, when all of a sudden he noticed a waitress and his reverie begins: “Suddenly, on the surface of the silk curtains near the door, something began to glitter. At first it looked like a large, silver coin, then like a full moon peering out of the red curtains. Gradually I recognized the mysterious object as a large silver tray held in both hands by a waitress, magically come, as if from nowhere, to serve us drinks. For a fleeting moment I visualized a scene from Salome, with the dancing girl carrying the freshly severed head of a prophet on a tray. I even thought that after the tray there would appear from out of the silk curtains a glittering Damascene broad-sword, or at least an old Chinese halberd. Gradually my eyes became more accustomed to the wraith-like figure of the waitress, and I gasped with admiration, for she was indeed a beauty! Without any explanation, she moved gracefully among the seven of us and began to serve drinks. 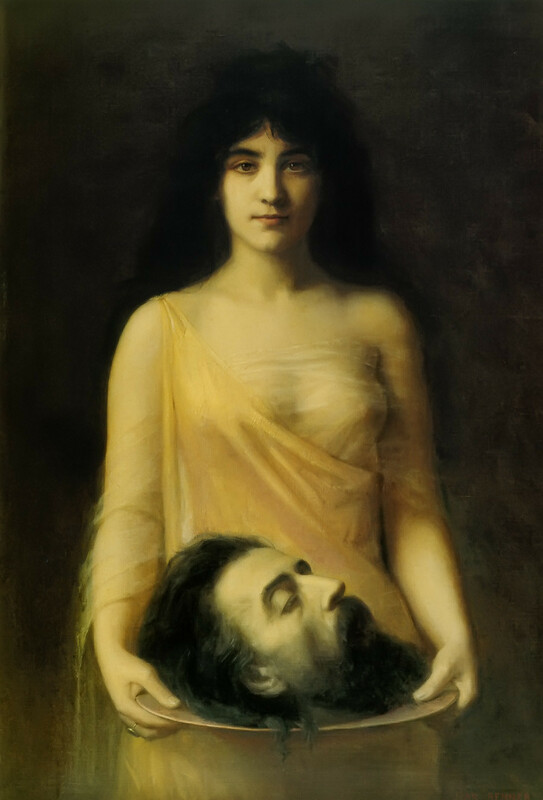 Salome is truly a fascinating femme fatale figure that appeared on many canvases, from Renaissance to fin de siecle, and it is equally thrilling to imagine her dancing seductively, dresses in shiny robe, adorned with jewellery and perfume… and to imagine her being so daring as to ask for the head of St John the Baptist, and hold it on a tray, how cool is that!? This was a very vivid passage of a story, very memorable.